Whispering Bells are a member of the Waterleaf Family. The plant grows to 20 inches in height and has grayish-green, long, narrow, lobed leaves that grow to 4 inches in length. The plant typically grows along washes and streams at elevations below 4000 feet. 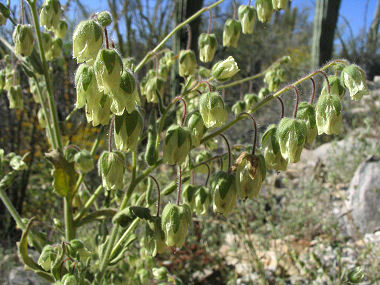 Whispering Bells get their name from the fact that when dry, the flowers make a rustling sound in the wind. Whispering Bells bloom between March - June and produce pale yellow, bell shaped flowers with 5 petals that grow in drooping clusters along its stems.